Apparently yesterday was National Popcorn Day but because I am a rebel and because, really, national popcorn day?? come on!! 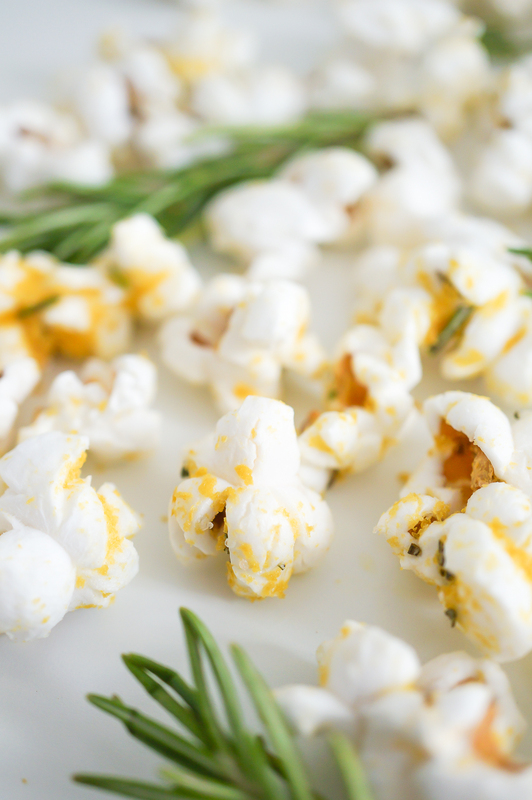 – I am posting a popcorn recipe today. Around my house, every day is popcorn day. 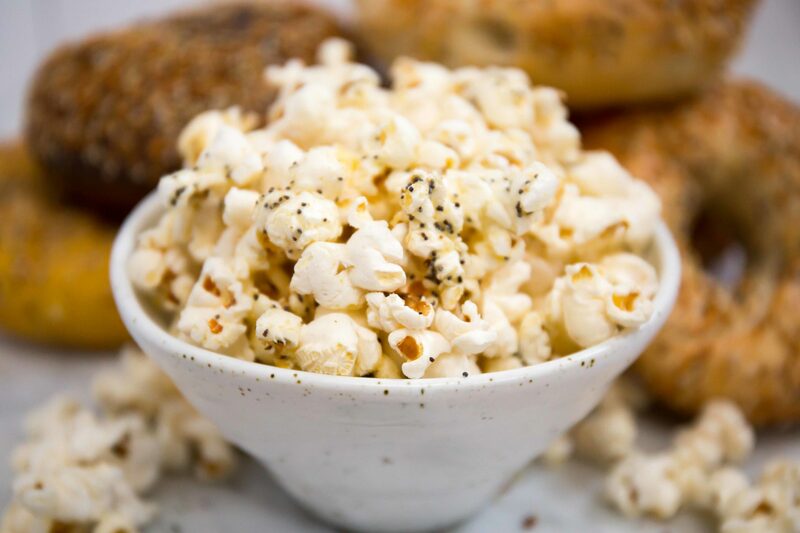 Popcorn’s such a staple – it’s so damn easy, super filling, incredibly snackable (I love foods that you eat little bites of slowly) and so versatile. 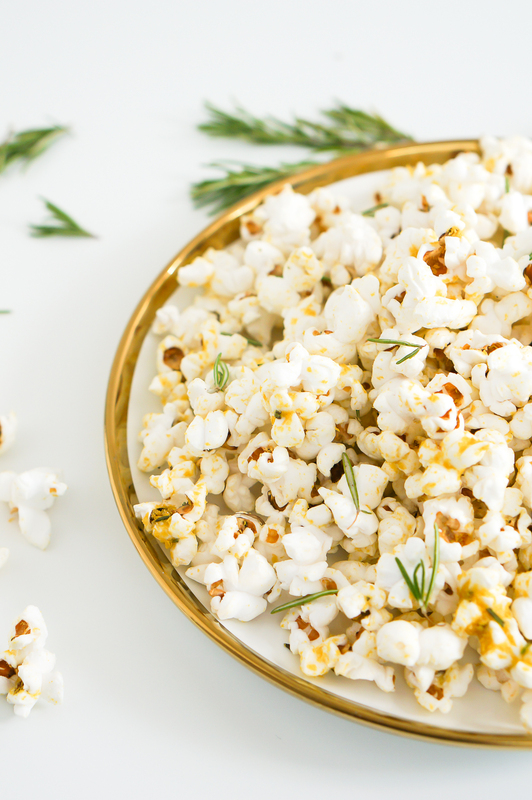 This cheesy rosemary popcorn, one of my favorite savory popcorn recipes, employs one of my favorite underutilized ingredients to get it’s cheesy, delectable flavor: nutritional yeast. Nutritional yeast is a single cell organism that’s grown on glucose, usually sugarcane or beet molasses. When the yeast is ready, it’s deactivated with heat, harvested, washed, dried and packaged. 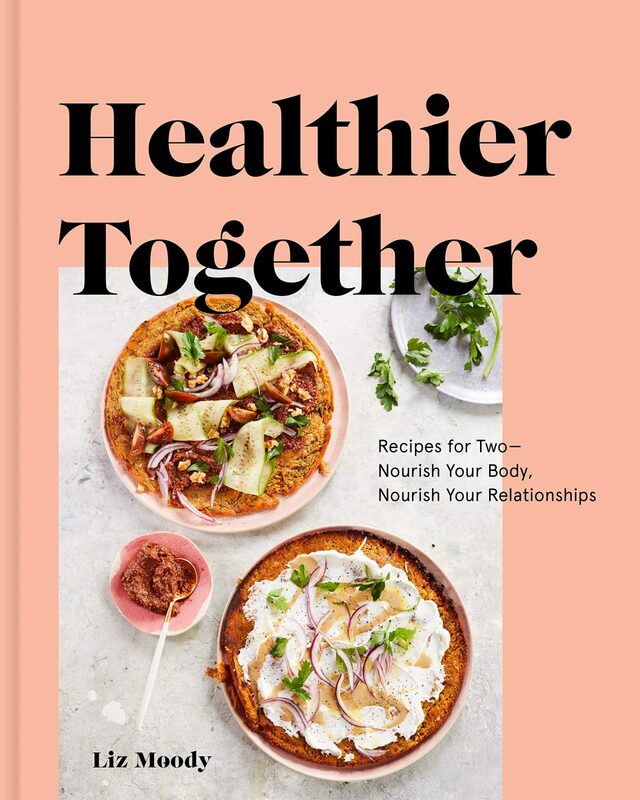 It’s super popular with vegans because it’s not animal derived (it’s a member of the fungus family) and it’s rich in B vitamins, which are typically found in red meat and other animal protein and vegetarians are often deficient in. Two tablespoons of nutritional yeast (or one serving) is about 60 calories, and provides 4 g of fiber and a whopping 9 g of protein. 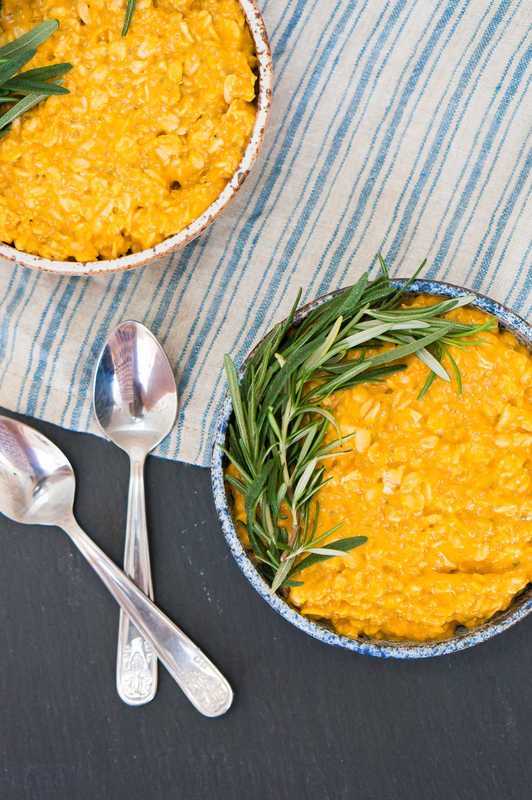 The taste is rich and most akin to cheddar cheese, and it’s powdered form makes it easy to mix into risotto or (as I’ve done here) sprinkle on popcorn. While I’m not vegan, I love this recipe because it’s the best way to get that cheesy taste I want on my popcorn without using artificial, processed cheese powders or gooey, hard to work with real cheese. 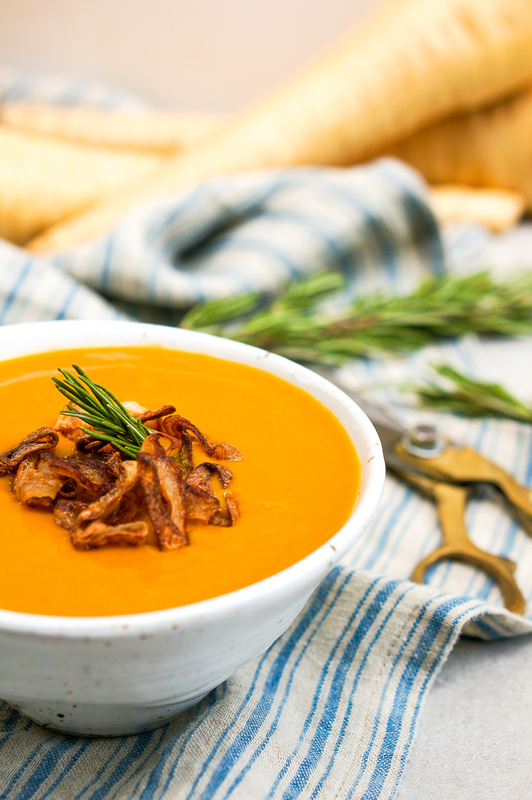 The rosemary adds a beautiful, herbaceous sweetness while olive oil gives that grassy, earthy depth that really ups the level of sophistication. 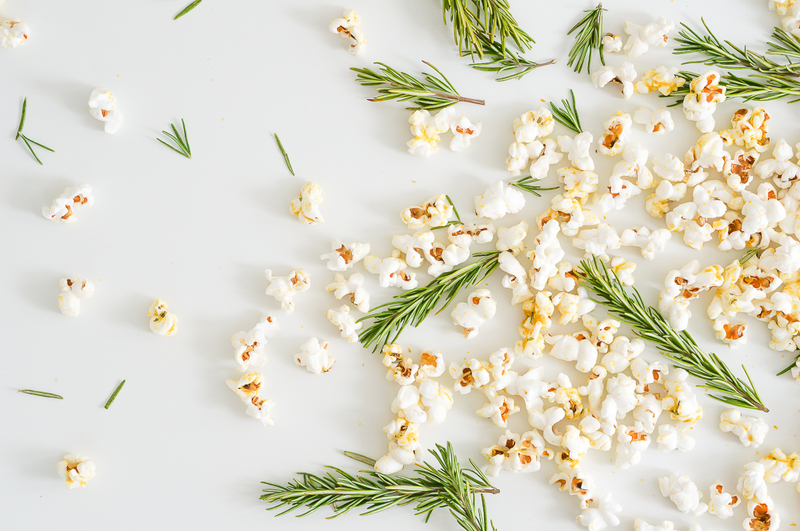 This is a popcorn that tastes a little fancy, a little gourmet, a little out of the ordinary. I think it’d be really fun to serve at a party (the Oscars and the Super Bowl are both coming up! ), to wow your guests while only doing 5 minutes of work. In a large pot with a lid, heat coconut oil over medium for about 1 min, then add popcorn kernels. Place lid on top and shake a bit to make sure kernels are well coated, then cook over medium heat, without touching, until popcorn kernels have popped, and popping has slowed to one or two pops every few seconds. 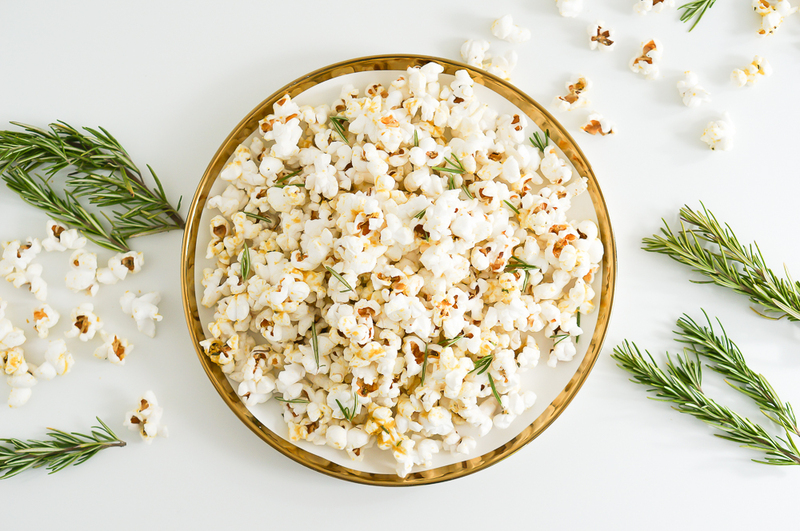 Remove from heat and add olive oil, rosemary, salt, and nutritional yeast, then place lid back on and shake vigorously for about 10 seconds, or until all popcorn is well-coated. Makes about 5 cups of popcorn. Such beautiful photography! Can’t wait to try this recipe. Is nutritional yeast available from grocery stores? Or am I better off trying a health food store? It’s usually in normal grocery stores, and ALWAYS at health food stores. You can also grab it online, since it’s a dry, non refrigerated product! Hi Merelyn! I use Braggs myself.